Fashion photographer Eugenio Recuenco‘s Caperucita Roja (above) inspired this theme. For a larger image and for more images from this series, visit Recuenco’s portfolio. 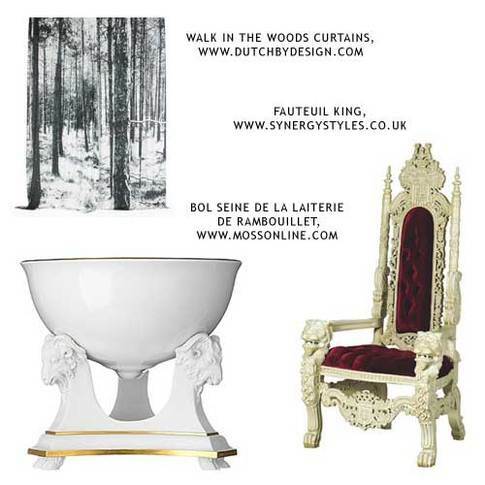 At left is an image of Faire Frou Frou’s Antique French Mirror. 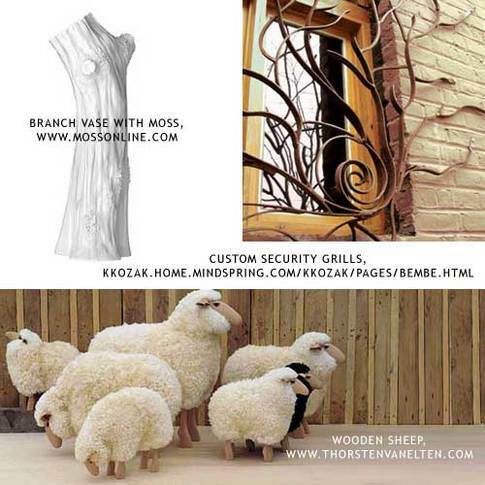 The custom security grills are by artist Kristina Kozak. Shelterrific posted on a version of this piece (with a golden fang) recently, and I thought–perfect! 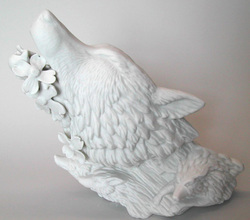 The head of the big, bad wolf (only porcelain, because real animal heads frighten me). The artist, Sarah Cihat, has been getting a lot of blog attention lately, and no wonder–her designs are incredible. The wolf head is part of her new collection, Dirt (see also the vases); her on-going Rehabilitated Dishware collection is equally stunning. After reviewing hundreds of stores, I made an edited list of on-line vintage shops. By vintage, I mean both vintage and secondhand/thrift pieces, with a focus on women’s clothing (I may do a housewares version one day–we’ll see!). I chose stores with interesting stock, acceptable mark-ups, (usually) pleasant websites, and good reputations. I try to update the list every few months, so it stays relevant. However, it’s not an end-all, be-all list: great new sellers pop up every day, and there’s no way I can list them all. Conversely, placement on the list doesn’t guarantee anything, so shop carefully. The directory is ordered alphabetically and by price range (below). Happy shopping! Stunning prices, varied collections. Extremely fun to hunt through. Spurred by rising fees, more and more vintage sellers have migrated from self-hosted sites and eBay to Etsy. What’s good for sellers is also good for buyers: Etsy stores combine easy to use, reliable interfaces with low prices (plus, no insanity-inducing auctions). 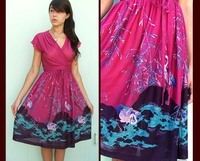 Check out the Etsy Vintage Directory for an edited list of sellers. Slightly pricier than the thrift-store items (often due to auctions), but still easy on your pocketbook. These collections were down for maintenance. We’ve heard good things about them, though, so we’ll review them ASAP. FASHIONISTA FINDSHigher prices than Cheap & Trendy stores, but still with affordable finds across the board. Great vintage stores with audiences to match. Auctioned items go high, and fixed priced items are snapped up as soon as they go on sale. Dresses and coats tend to go for $150+, while accessories and separates remain affordable. Too expensive for most of us, but some truly stunning selections. Prices typically start at $500 (although some only start around $250). These stores focus on collector’s items rather than wearables. Prices frequently range between $650-$2000+. Extremely fun to look through. As a complement to the Retro Fashion Guide: Clothing, here’s a listing of retro make-up, hair, and accessory resources to complete the look. Note: Although donning full retro garb, hair and make-up may be tempting, be sure to dilute the look with something modern. Think Scarlett Johansson, Gwen Stefani, or Dita Von Teese on the red carpet–all retro-inspired looks that are still very today. Besame Cosmetics: Started in 2004 by Gabriela Hernandez, Besame Cosmetics is a high-quality line inspired by the pigments and packaging of the 1930s and 40s. The popular Enchanting Lipstick Set is pictured at left. ReVamp Vintage: Under Chapter VI (left side), find links to make-up guides for the 1920s & 1930s (no direct links). Short and sweet make-up guides to the 1920s, 1930s, & 1940s. Here’s a vintage make-up thread on The Fedora Lounge. Products from Besame, Benefit, and MAC received frequent mentions. Image at right courtesy of Paula Wirth, via Flickr. 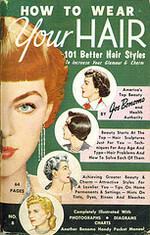 ReVamp Hair: Under Chapter VI (left side), find links to hairstyling guides for the 1910s-1940s (no direct links). Hair Archives: A good resource, although the most useful section for DIYers is The Archives. Nocturne: The place for finger-wave and pin curl how-tos, among other things. If you’ve ever picked apples on a farm, or eaten fresh, unwaxed produce from the farmer’s market, you know how delicious local food can be. What’s more, eating local’s better for the environment and often less expensive. Even those far from the farm can enjoy a local harvest. Many urban dwellers eat local by joining a CSA or shopping at farmer’s markets (find both at LocalHarvest.org). In addition, if you have some roof space, a balcony, or a sunny room, you can have a mini-garden of your own. Here are 6 tips to get started. First, check out the following books. You Grow Girl is a pretty but solid gardening book by Gayla Trail (see also the info-packed You Grow Girl website). The highly rated McGee & Stuckey’s Bountiful Containers focuses on container kitchen gardening, while GRUB tells you how to prepare your sustainable eats (see also the GRUB website). For more general overviews of sustainable eating & living, read The Real Food Revival (read an excerpt here) and The Newman’s Own Organics Guide to a Good Life, co-written by Nell Newman. Second, visit the American Horticultural Society’s website . In it, you can find a Gardening Q and A, links to gardening resource center sites, and information on master gardener courses throughout the country. Third, get your gardening supplies at Home Depot. Actually, get them anywhere you like. Smith & Hawken is pretty, if pricey; Shelterrific recommends GRDN, a similarly stylish store aimed at urban gardeners. Domino Magazine’s Black Book has great gardening supply links. On the budget end, Home Depot, Wal-Mart & Lowe’s have well-stocked gardening sections, and Target offers a Smith & Hawken line. Local nurseries and farms are good resources (see the wonderful LocalHarvest Store). You can also get used supplies at garage sales, on eBay, from family & friends (ask around–you’re bound to find someone who’s bought supplies they never use). If you have several friends in the same building with their own gardens, you can always share gardening tools. Fourth, numerous blogs have mentioned the AeroGarden by AeroGrow International. It features “NASA-tested Aeroponic Technology”, and has daylight spectrum bulbs, making it perfect for those with darker apartments or blacker thumbs. AeroGrow offers seedpacks for chilis, cherry tomatoes, international basil, petunias, and garden greens, but my favorite is the pack for herbs (cilantro, chives, italian basil, red rubin basil, dill, mint, and parsley, pictured at right), which are expensive fresh and spoil quickly. Other possible solutions include this Upside-Down Tomato Garden from Hammacher Schlemmer and the Hortuba table profiled by Treehugger. McGee & Stuckey’s book, as mentioned before, specifically tackles gardening in small spaces using containers. Fifth, the movie that taught me more about gardening than any other: Saving Grace. It’s not a great film, but for pure inspiration, nothing beats Grace’s (a winning Brenda Blethyn) heroic rescue of a marijuana plant. Farm Girl Fare, an wonderful website by a Missouri-based farmer. She has the best mother’s day post ever (featuring a lamb). Eat Local Challenge, which was recently profiled on Typepad’s homepage. Treehugger tells you how to Grow Your Own Food. Another thing to consider is community gardens, a slightly different subject that deserves another post. For now, see the Green Guerillas’ website for more information.